At Conroy's Old Bar there's something for EVERYONE ! in generic accommodation, that does nothing to enthuse the parents at all ? but you may be pleasantly surprised to find, it may well be !!! What's available for the Children ? like cots, bedding, high chairs etc..
everything is there for you to use FREE of charge. 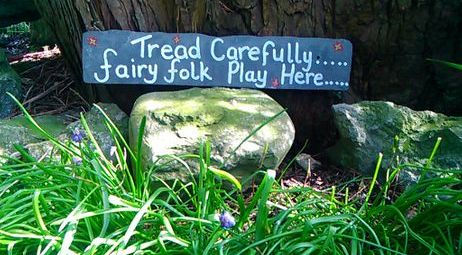 including a tree swing and The World of Fairies enchanted Fairy Garden. Cottage Garden Craftworks, World of Fairies Workshop, it can be opened by arrangement during your stay. And approx 600yds from Conroy's Old Bar there is also a lovely children's playground. Conroy's Old Bar has become a very popular holiday destination for families with teenagers. solution in having one last holiday with them, by coming to Conroy's Old Bar. "in a pub" (albeit a "Pub With No Beer") and the family having it all to themselves. and cooking alfresco on Conroy's very apt beer barrel BBQ. The first official mountain bike park in Ireland that caters for beginners to professional mountain bikers. A great place to bring friends and family to cycle on purpose built mountain bike trails. Pony & horse riding is available close by, as well as kayaking on Lough Derg. As with every family holiday, knowing the the children are happy, makes the parents happy. "how much they just want to get back to Conroy's and enjoy more playtime". a break away in unique accommodation. All in all, it's great opportunity to have a wonderful holiday together and make memories.